The NCAA needs to compensate college student-athletes. We are inching closer and closer to March Madness. 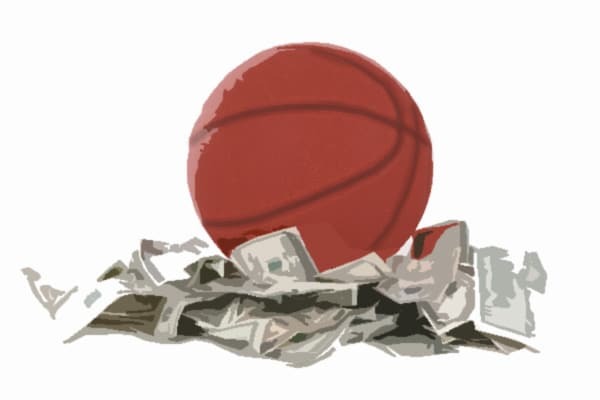 The annual NCAA college basketball tournament generates billions of dollars in revenue. None of this revenue goes to the stars of the show. The basketball players. According to SB Nation, last year the NCAA received $857 million from Turner Sports for broadcasting rights of the basketball tournament. In total, the NCAA makes $11 billion annually from college sports. Athletes take home none of it. The disparity gets uglier when you realize that the NCAA isn’t harboring all the money. Out of the total $1.07 billion dollars made from March Madness, the NCAA paid $560 million to Division I schools. None paid out to Division I athletes. In fact, Forbes recently ranked U of L as the most valuable college basketball team in the nation. The report said U of L basketball had average revenue of $52 million and profits of $30 million from the 2014-2015 season through the 2016-2017 season. Now, the money that schools receive from the NCAA does support athletes. They benefit from academic scholarship and athletic program funding. The schools and athletic departments have the freedom to decide where they invest their revenue. According to Forbes, most of this money goes towards hiring coaches, athletic directors and administrators. In most states, the highest paid public official is a head coach of a university’s football or men’s basketball team. Coaches are making millions, while players receive a scholarship. Freshman marketing major Merise Mywambayi says that the scholarship and benefits that athletes’ receive is fair compensation. “They are already getting paid with the full scholarships that they’re receiving,” said Mywambayi. Comparing college athletes to traditional students, senior sociology major David Mucker agrees that their benefits are a privilege. “Essentially, people feel that the value of what they receive in food, housing, etc., is already payment enough when you consider how traditional students experience college,” said Mucker. Nonetheless, Mucker contends that the value of student-athletes’ benefits is negligible compared to the amount of revenue that they make for their school. “However, I feel that in relation to how much money college athletics makes off the athletes themselves, to players their worth, that number would be minimal,” said Mucker. Mwambyai argues that being an athlete in college is enough of a benefit. He warrants that student-athletes go to college to learn. A funded college education in of itself is a privilege. “Being a college athlete is a privilege but also when you look, athletes are labeled student-athletes,” said Mwambayi. Although they are not professionals, student-athletes are not students first when they represent their school. They are the marketing and labor for a lucrative billion dollar industry. A freshman member of U of L’s marching band and pep band Mikaela Bertholf says that the determination and dedication to a sport is reason enough for compensation. She is a compensated student-athlete for being apart of the pep band, but only receives the academic scholarship for the marching band. “My compensation for each game goes to me because it’s like a job. We are the entertainment that people are paying to watch and we should be treated accordingly,” said Bertholf. America has a history of institutions that use unpaid labor for lucrative revenue: slavery and the prison system. According to The Intercept, the NCAA actually justified not compensating athletes by citing the legality of unpaid prison labor. The system of compensation would be complex, but an important first step would be recognizing that student-athletes aren’t just playing for fun. Their mental and physical sacrifices are enough reason to pay them. Considering the money that NCAA, schools, and coaches receive, being a student-athlete should be looked at as a job as well. OK but let’s take away every dime of athletic scholarships and other compensation. Make athletes the same as the other 80% of students on campus. Have them pay 100% of their tuition before they are able to step into class. Have them pay 100% of their housing before they can move into dorms. Have them pay 100% of their labs and book cost before they can get access to books or lab. Have them pay 100% of the cost of their food before sitting down for a meal on campus. Other students have to go and get jobs to pay for these expenses and guess what. The money they make on their jobs to pay for all this is taxed. Or they have to take out student loans and are hundreds of thousands of dollars in debt by the time they graduate and spend decades paying back those loans. And NONE of these other students got a break on minimum admissions requirements due to their ability to play a game. A friends daughter got a 28 out of 36 on her ACT with a 4.0 GPA in high school and was TURNED DOWN for admission to Vanderbilt. Yet I am certain that 90% of those on athletic scholarship do not come near those same requirements and got in. Lets not forget about Title XIX which could be interpreted in such a way where EVERY female athlete on EVERY team must be paid the same compensation as football or Men’s basketball players. Which would require the schools to drop certain teams in order to save solvent and in doing so t still maintain the same ratio of men and women’s sports. 90%+ of all athletic programs LOSE MONEY right now. Instigate a pay the players plan and the others will also lose money.